My days at Elephant Nature Park consist of a lot of animal time. When Navann, the park’s new baby, was born on Oct. 28, it thrilled me to no end. I get to spend time with a baby elephant! And, while I don’t get to see him too often, the times I do are pure delight. 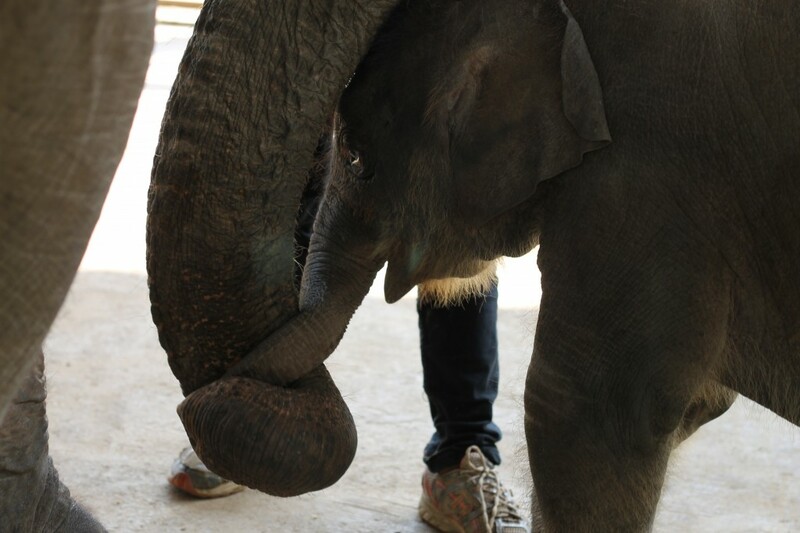 Yesterday, I spent a few minutes with him and his mom, Sri Prae, as he enjoyed a little interaction. But, my favorite moment wasn’t when he was head-butting me, but when he and mom took a moment to show their love to each other. Oh, elephant beauty and trunk snuggles. I can’t wait for you to come and see them! In love, eh? Me, too! I asked for a baby elephant for Christmas… no dice. If Santa had seen this pic, he would definitely have complied! Awww!! They don’t make great Christmas presents, though. Suddenly, they are the size of your house!